On November 18, 2015 February 16, 2018 By felicitousfelixIn Are There Lesbians? Our intrepid heroine Sophronia is back in the fourth and final installment of the Finishing School series. Still reeling from the events of Waistcoats & Weaponry she must nonetheless tighten her corset laces and save Queen and Country from Pickleman threat, only it’s hard to do this when you don’t even know what that threat is! With no one believing her and the possibility of a double agent in their midst, Sophronia and friends must use all the skills they have learnt at Madame Geraldine’s Finishing Academy for Young Ladies of Quality- for the good of the Commonwealth, tasty comestibles and decent fashion sense! Once again I find myself saying that there aren’t any lesbians when this is not entirely true… it is simply that there is only one, very small lesbian and you only know this if you have read Gail Carriger’s other series The Parasol Protectorate (which you really should) so much as I would prefer otherwise, I do feel that she hardly counts. I am unashamedly in love with this world that Carriger has built – steampunk Europe with werewolves, vampires and ghosts thrown in for good measure. With trademark style and wit, she brings her second series (and first YA series) to its exciting and very satisfying finale. Picklemen and girls alike are finished (although not in the same way), secrets are revealed, and there are more than a few tidbits for those of us who have read PP, something that caused no small amount of excited shrieking from me! 1) Does Soap get the hell out of dodge before the events of Soulless? Or does he not count as a Loner by that point in time? 2) Where is Captain Featherstonehaugh???? 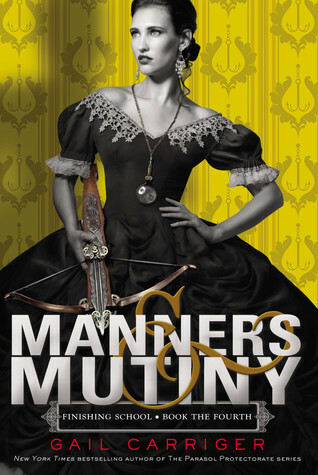 Full of humour and romantic moments as well as the odd murder, Manners & Mutiny, as well as The Finishing School series as a whole, is a wonderful series that I simply cannot recommend highly enough. I have been known to get quite evangelical about Carriger’s works on many occasions and her books have formed the basis of several friendships. Don’t take only my word for it however and read as many of these books as you can possibly get your hot little hands on, I can promise you won’t regret it.